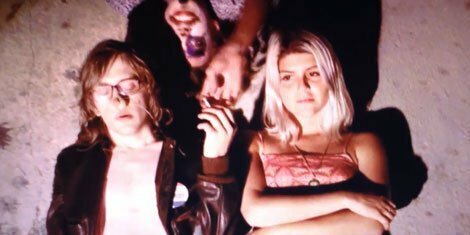 The Growlers have released a pair of music videos that go along with two psychedelic-surf tracks from their recent EP, and watched together, they tell a cohesive story. First up is "Dogheart II," which is the slightly lighter prelude that follows a fun-loving couple as they bound about on a summer day. There's something sinister going on, but it won't be clear until you delve into the second chapter. "Ol' Rat Face" is a folkier track and the accompanying video is a murderous, revenge-fueled trip through the title character's life. Set to hallucinogenic banjo-like pickings, he band throws Rat Face into a lake and things take a dark twist from there. Moral of the story: Don't pick on people or they might run you down with a van. Both videos were done by Taylor Bonin and Austin Chapman and the tracks are from the recently released Gilded Pleasures EP, a 9-song follow-up to this year's Hung At Heart. You can buy it through iTunes. For a more far-out, more-NSFW video from The Growlers, check out "One Million Lovers" right here at Zumic.